If you are a former NUD/NCT user and would like to migrate your data to BusyCal and BusyContacts, this article explains how. 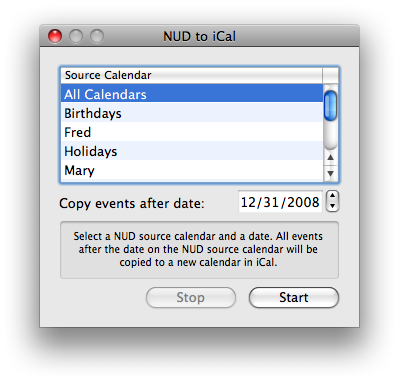 Back in the day, Now Up-to-Date (NUD) and Now Contact (NCT) were the undisputed champions of calendaring and contact management for Mac users. We know, we're the original developers. But the apps are no longer supported, have not been updated in many years, and are not compatible with recent versions of OS X.
BusyContacts supports importing vCard files. If you export your data from Now Contact in vCard format, you can then import it to BusyContacts. However, the Notes field in Now Contact does not properly import into BusyContacts using this method. As a work around, you may be able to solve this using Apple Contacts as an intermediary by importing the vCard fle into Apple Contacts first. Once in Apple Contacts, you can sync the data to BusyContacts through iCloud, or export in vCard format form Apple Contacts and import into BusyContacts. There is also this public domain AppleScript that was written to extract more data out of Now Contact, for the more adventorous. BusyCal supports importing ics files. However, Now Up-to-Date does not export in ics format, so you have to use an AppleScript utility and iCal as an intermediary. NUD to iCal is an AppleScript utility that copies events from Now Up-to-Date to iCal. You may download NUD to iCal here. Once you run the script and import your NUD data to iCal, you can then export each calendar from iCal in ics format and import into BusyCal. Note: NUD, NCT and the NUD to iCal script require OS X 10.8 Mountain Lion or earlier and will not run on 10.9 Mavericks or later. Also, the NUD to iCal script requires NUD 5.3.2. If you don't have it, you can download NUD 5.3.2 here. Source calendar — You may copy events from all calendars (categories) in NUD, or a single calendar. 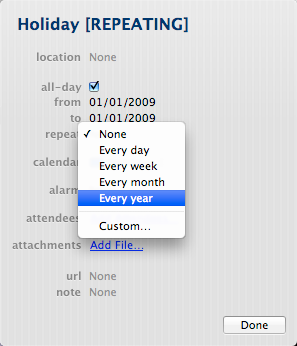 Date — All events on or after the date specified will be copied to iCal. If any of the categories you are attempting to transfer are public categories, then the server must be online. If the server is not online, you may be able to export the public category, then import it as a private category and try again. It is recommended that you set a short date range, like one year, and NOT import 10+ years of events from NUD to iCal, as it will take a long time (many hours) to process and iCal will run very slowly if you add that many events to it. When you click Start, a new calendar will be created in iCal for each source calendar (category) in NUD, and all events that occur after the date specified will be copied to iCal. The progress will be displayed on the bottom of the window while the events are being imported. Processing can take a while depending on the size of your calendar. Make sure you allow plenty of time for processing to complete and do not use or quit NUD or iCal while NUD to iCal is running. You may click the Stop button at any time to stop processing. An alert will be displayed once processing is complete, informing you how many events were imported and to reconfigure the repeating events in iCal. Note: NUD stores repeating events as a series of individual events, whereas iCal stores repeating events as a single event with a recurrence rule. Therefore, repeating events in NUD are not copied to iCal. Instead, only the first occurrence of a repeating event in NUD is copied to iCal and the word "[REPEATING]" is appended to the event title so you can easily find these events in iCal and reconfigure the repeat interval. You may search for the repeating events in iCal by entering "repeating" in the search field in the upper-right hand corner of iCal. A list of the matching events will appear on the bottom of the window. 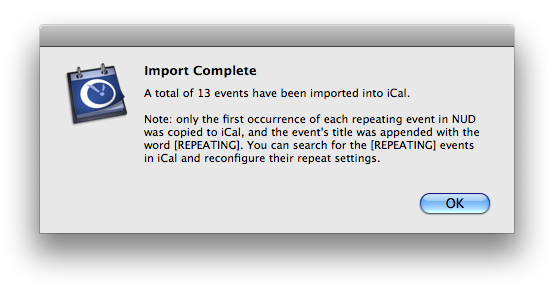 You may then double-click each one, and reconfigure the repeat interval and edit the event title, as appropriate. And that's it. All of your events in NUD have been copied to iCal.